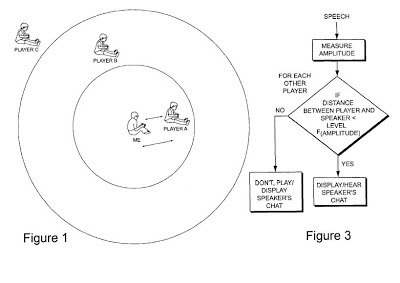 The ‘123 patent describes a system during online multiplayer games where a player’s voice varies depending on the distance between the two characters. Thus, whenever a player’s character is in the immediate vicinity of his teammate, that teammate will be heard loud and clear. But as the distance between the two characters grows, the voice will quiet and become less clear. This invention helps the game feel more life-like in that voices vary much like they would in person. The amplitude of a video game player’s voice determines how far his or her message is carried to other players in the game. The range a message carries is based on the relative virtual proximity of avatars associated with said players within the virtual game environment. 1. A video game system comprising: an audio transducer that receives acoustical information including speech; an amplitude detector that detects the amplitude of said received acoustical information; and a messaging arrangement that selectively messages other players of said video game as a function of (a) said received acoustical information, (b) said detected amplitude, and (c) the respective relative virtual proximity of avatars within said video game that represent said players.